All SAPA events, dates and presenters will be posted on this page once speakers and dates are confirmed. NEXT UP – A SAPA Candid Conversation, Financing NYS’s Infrastructure Needs, April 11, 2019,12:15 pm – 1:30 pm. How do we finance the many, many essential public works projects that impact the quality of life for New Yorkers? How does politics decide where the funding goes? Join us for this Candid Conversation. For more information and to RSVP. 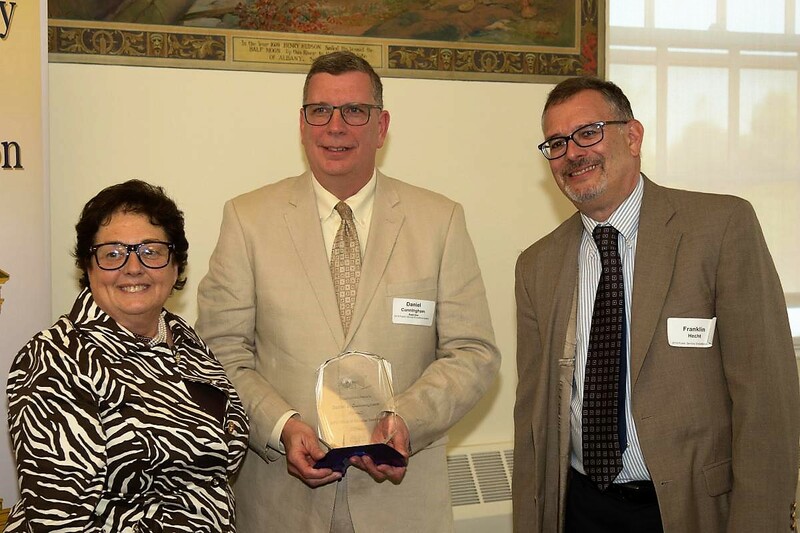 The 2019 Public Service Excellence Awards ceremony will be held on Monday, May 20, 2019 at the Rockefeller College of Public Affairs and Policy in Albany. This will be the eighth year that SAPA will present these awards which are designed to demonstrate our appreciation for a special group of outstanding public servants. The nominating period is now closed. Awardees will be notified in early May. A special thank you to University at Albany’s Rockefeller College of Public Affairs and Policy for co-sponsoring the Excellence Awards Event. For a full list of SAPA Awards go to this link. CANDID CONVERSATIONS (As speakers are confirmed, a date and information will appear below) All sessions are held in room 148 of the Alfred E. Smith State Office Building (AESOB) from 12:15 pm – 1:30 pm unless otherwise noted. October 23, 2018, Room 111 of the AESOB, 12:15 pm – 1:30 pm – How is New York State securing the 2018 elections. The news has been filled with reports of election tampering through the use of social media and direct entry into state and local election systems. This Candid Conversation was led led by the co-Executive Directors of the NYS Board of Elections and focused on what New York is doing to ensure that elections in our state are fair and uncompromised. During this Candid Conversation we learned that New York’s election system is not Internet based and has various forms of backup, thereby making it much less vulnerable to hacking and encroachment. Thanks to Todd Brehm and Robert Valentine for leading this discussion. November 15, 2018, 12:15 pm – 1:30 pm – Debriefing the 2018 mid-term elections. Two noted New York State political experts and insightful political observers led a well attended conversation to assess the mid-term elections and what this could potentially mean for public policy issues and also the implications for the 2020 elections. Frank Mauro is former Director of the Fiscal Policy Institute and a senior state legislative staff veteran. Gerald Benjamin is a Political Science Professor, who also served as Associate Vice President for Regional Engagement and Director of the Benjamin Center at SUNY New Paltz. During the conversation they identified trends and traits from the mid-term results. There was an increase in voter participation, Republicans lost an entrenched presence in the NYS Senate, and there will be greater discussion about election reform. December 13, 2018, 12:15 pm – 1:30 pm, Refugee Crisis Management: The Challenges for State and Local Government Agencies – Separation of families, a border wall, detention of immigrants, asylum seekers, and refugees. All of this and more has been in the news for several months. But we hear little about the intersection of what is taking place on the national scene and the role of state and local agencies. And even less when that intersection has to do with refugee assistance, in which nonprofits play a major role. This conversation centered on how state and local organizations are involved and the differences they make. Our Candid Conversation leaders were Jenifer Rajkumar, Director of Immigration Affairs & Special Counsel, New York Department of State and Roman A. Vidal Guzman, Immigration Program Coordinator, The Legal Project, Albany. Both organizations work closely with local governments to provide assistance to immigrants and refugees. February 21, 2019, 12:15 pm – 1:30 pm, Is affordable Universal Health Care possible in New York? – Suppose we could wipe the health care slate clean and start all over? What would such coverage look like and who would pay for it? These and other questions were explored by our presenters Donna Frescatore (NYS Department of Health ) and Mark Zezza (NY Health Foundation). Donna described the state of the current insurance marketplace in New York as established under the Affordable Health Act. Mark reviewed the recently issued Rand Corporation report about the NY Health Act which has been proposed in the NYS Assembly for many years and, if enacted, would establish a single payer, universal health insurance program in New York State. April 11, 2019, Financing NYS’s Infrastructure Needs – Crumbling bridges and roads, archaic airports, transportation systems that need repair, expansion and modernization, leaky water and sewer systems, and much, much more. How do we finance the many, many essential public works projects that impact the quality of life for New Yorkers? How does politics decide where the funding goes? During this conversation we will explore this question and more. For more information and to RSVP. For more information and to RSVP. 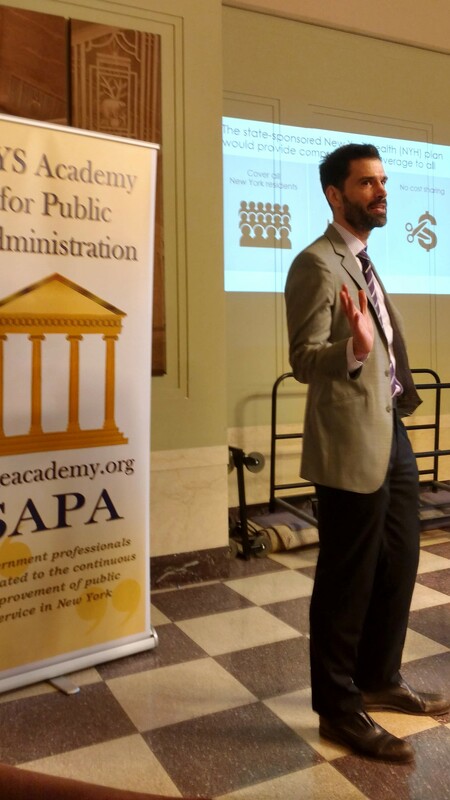 SAPA Public Service Excellence Award Ceremony, May 20, 2019 – Do you want to feel really good about government and all that it does? 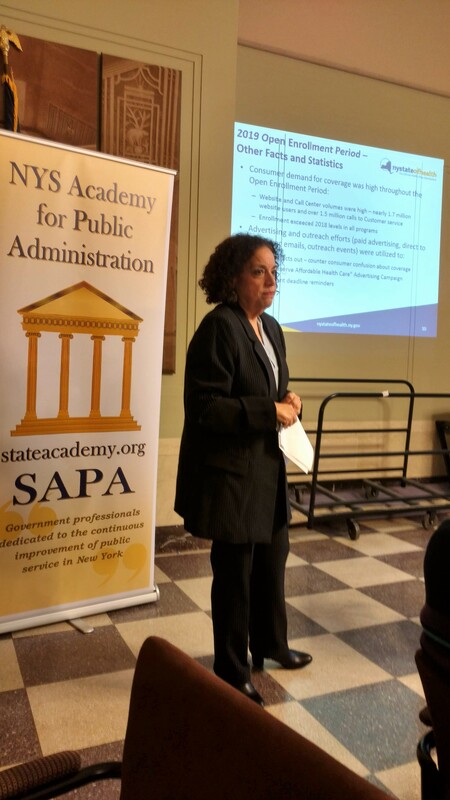 Then put this date on your calendar as we celebrate public service in New York with the SAPA Public Service Excellence Award Program to be held at Rockefeller College of Public Affairs and Policy in Albany. Nomination information has been sent to NYS Agencies and other organizations. For 2018 we introduced Essentials in Public Administration which is a program targeted to our newer public administrators. The introduction of this program coincided with the addition of two new categories of SAPA membership: New Professional and Associate Fellow. Enrollment for this year is at capacity. Participants interested in applying for next year’s program must be nominated for the program by a State Academy Fellow or a senior manager in their agency or local government. Essentials, which began November 2018, provides New Professionals in state or local government an opportunity to learn more about relevant issues of state public administration and to network with one another and with mid career and senior public administrators in New York State. Participants were nominated for the program by a Fellow or a senior manager in their agency or local government. Senior SAPA members are invited to attend Essentials sessions to network with and mentor the promising New Professionals who are participating in this program. The 2018 SAPA annual meeting took place on Wednesday, September 12, 2018. A SAPA Board meeting followed. New members were introduced and a summary of the 2017-18 program year, including the Treasurer’s report was presented. A look forward into 2018-19 also took place. The meeting was held at Rockefeller College of Public Affairs and Policy which continues to be a valuable SAPA partner. We welcome your participation in all of our SAPA events!